I’m excited to announce that Ocean State Poets — which holds a “Words into Poetry” session the second Saturday of every month at 3 p.m. at the Middletown Library and features an open mic — has gotten a nice little write-up in The Bay. Just follow the link below to read it. 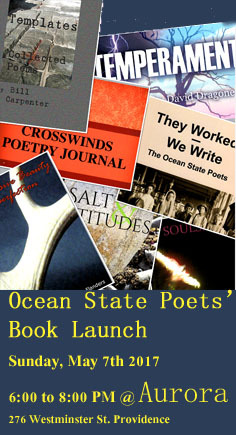 Reading Monday, December 9, with Ocean State Poets! I’ll be reading Monday, December 9, with the Ocean State Poets at the Newport Public Library at 300 Spring Street in Newport. The event begins at 7 p.m. Take a break from your holiday craziness and come enjoy some poetic downtime.